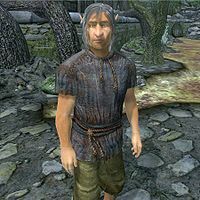 Bolwing is a Bosmer commoner living as a beggar in Crucible, New Sheoth. He speaks only in his nonsense language, in which he seems to rearrange words and phrases until they retain only the barest semblance of meaning. When Big Head gives you his charm or you complete the Main Quest, Bolwing will speak normally. In reality, he is very articulate and will point you towards Big Head's obsession, The Fork of Horripilation. His bedroll is located in a hole in the city wall, behind Ma'zaddha's house. He sleeps there between 10pm and 6am and always starts the day by wandering sleepily around near his bedroll. He worships at the Sacellum from 7am to 9am, and if he has any food he will eat it at 6pm, sparing it for two hours. For the rest of the day he hangs around the southern city gates, sometimes trying to converse with the Dark Seducers who will reject his babbling. If you are between the quests Ritual of Accession and Retaking The Fringe, Bolwing will skip his 7am trip to the Sacellum and instead stay near his bedroll until 9am. He wears a sack cloth shirt with sack cloth pants. He carries a tan cup and a piece of food. Bolwing is infected with the disease Ataxia and can pass it on to you if engaged in combat. When you meet Bolwing for the first time, he will most likely annoy the Dark Seducer guard patrolling the southern gate: "Rany Roo! Rany Roo! ", "I saw the Zaxer. And I magged it too. Aw, fribble!" and "Tell the daen! Tell the daen! Karn sky is relfing." When you talk to him, you will get: "I'll Kalicrak the Findoo. I will. You Terratet it!" When asked for rumors, he will just shout: "Fribble! Just Fribble!" Also, when exiting conversation, you will get more gibberish: "Gal bursten it." Once you have initiated The Fork of Horripilation, fork-obsessed Argonian Big Head will hand you his charm with the words: "Talk to the beggar! Talk to Bolwing! He knows secrets, but no one can hear them. No one but Big Head. Take Big Head's charm! Listen to Bolwing! His tongue is tied, but his mind is unraveled! He'll tell you the secret. Who has the Fork?" When you approach him after this, he will be quite surprised: "Fribble, just frib... Wait. You can understand me? Lovely! It's been too long since I was able to have a nice chat with someone. What a pleasant surprise. Previously, it was only poor Big Head who seemed to understand me. And he's always in such a lather about that Fork." When asked about the fork he will give you quite a few clues: "Ah, yes. The Fork of Horripilation. I have heard rumors about it. It appears that Lord Sheogorath has returned it to the Isles. Not surprising, I suppose. He does enjoy his toys. Last I heard, some Heretics had gotten hold of the item in question. Unfortunately, it seems to be an item of great importance for some of the Zealots as well. They've been fighting over it for some time now." He will also reveal his distaste for gossiping: "I try not to burden myself with news of the current goings-on. It gets to be rather distasteful at times. Don't you think?" When you leave, he will say: "Take care! Come back for a chat whenever you have the chance." As long as you are carrying the charm, Bolwing will have a new greeting when you get near: "Greetings and salutations!" When Big Head takes back his charm at the end of the quest, you will be unable to hear anything but gibberish again. 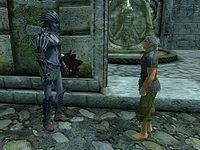 After completing the Main Quest, approaching Bolwing will prove quite surprising: "Why does everyone in this city look at me like I'm speaking gibberish?" When you tell Bolwing that you understand what he says, he will be pleasantly surprised: "You...you can! Bless you, My Lord! I should have known that you of all people would be able to understand me!" His strange vocabulary can be heard during a few other quests as well. During The Lady of Paranoia, asking Bolwing about the conspiracy will net you the following nonsense: "Naryan that! I'll balitoe before I krayble." If you, however, carry Big Head's charm and ask him again, Bolwing will be much more articulate, although equally unhelpful: "You're the only one who understands me, and you'd think me a traitor? You disappoint me, friend. I'll take my leave now." During Falling Awake, when you are tasked with talking to the homeless for a new, safer bed to rid Amiable Fanriene of his paranoia, talking to Bolwing will have him say: "Friend no dorpidity? Communce to Uungor. Uungor communces he no deliriotic, that he mented fine. But Uungor is very deliriotic. Oversit me? Uungor communces he "bye-bye." Communce with Uungor. Are you identing me? Communce with Uungor! Give friend dorpidity in Uungor's dormitiloo." While the name Uungor is recognizable and will provide a quest update, asking for the same when carrying the charm or after the Main Quest will have him say: "Anything I can do to help you. Really, you should speak with Uungor. He doesn't want to be here, anyway. Poor fellow believes himself sane! I'm sure it will be sufficient. Poor, poor Uungor. So misunderstood. And, I know what that's like. Good luck in your endeavor, my friend." If Bolwing is killed and his tombstone in New Sheoth Graveyard is activated, it will read: "I think his name was Bolwing." On Obelisks: "Grundy obelisks! Always tetterating knights and festars. Use the dookas to fix them." On Scalons: "Dark-dark. We've been yinging a zeffle." On Shambles: "Give them gargen to emeet with." On Elytra: "They die quickly if you jejinak them. Jejinak! Jejinak!" On Baliwogs: "Foul tergens they are. Heffin all of them." On Skinned Hounds: "Sendockle the Klen. Do you understand? The Klen!" On Heretics: "Gorble. Can't you hear them gorbling?" On Zealots: "I've got a Quintat that says they can ipanate"
On Quests: "Have zickle to it. Nobody does rebby zickles any more." Bolwing cannot be persuaded via the Speechcraft minigame. This page was last modified on 25 September 2018, at 22:38.